This news item was posted in Dental, K, Vitamin category and has 0 Comments so far. Ketosis is a condition associated with the elevated levels of ketones in the blood. Ketone bodies or ketones are water soluble chemical compounds which are produced as a by-product of fat metabolism. Ketosis is nothing but a phase of metabolism where the body breaks down fat for energy. Though ketone bodies are always present in our body, but being in a stage of ketosis can sometimes be a cause of serious concern. Ketosis breath is just one of the many symptoms of ketosis. Wondering about the connection between ketosis and bad breath? Go through this article to find out what is ketosis breath and how it can be treated. 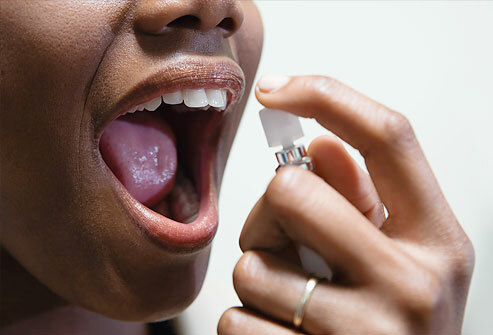 What causes bad breath on a low-carb diet? There are many causes of bad breath, but if the change in your breath happened suddenly after starting a low-carb diet there are two main causes: 1) bad breath due to acetone caused by ketosis, and 2) an excess of protein in the diet producing ammonia in the breath. One of the results of cutting carbohydrates in our bodies that is that we start to use more fat for energy. This process generates molecules called “ketones”. One type of ketone, called acetone, tends to be excreted, both in the urine and the breath. The description of the smell varies, but it is often described as “fruity” or like the smell of apples which are “past their prime” (or even downright rotten). Drink more water: try 8 glasses per day to see if this helps, and then you can experiment from that point. Natural breath fresheners to try include mint, parsley or other greens, cloves, cinnamon, and fennel seeds. Some people swear by breath capsules, which are usually made from parsley oil (e.g. Mint Assure) for keto-breath. Others find they do not help. Sugar-free mints or gum can be tried, but watch the carbs in them. When the body metabolizes protein, ammonia is produced. When people eat high-protein meals, there tends to be increased ammonia in their breath and/or urine. In large amounts, this can smell pretty bad. It’s important to remember that we don’t need lots and lots of protein in our diets. Our bodies use protein to maintain and build muscles, to make enzymes, and for other structural and chemical needs. The body will convert excess protein to energy, which is where you will get the extra ammonia (this also happens during starvation or long exercise when the body begins to rely on breaking down muscles for energy if it runs out of sources of fats and/or carbohydrates). Sometimes people load up on protein because they are afraid to eat more fat. This is one of the reasons why it is rarely a good idea to try to eat a diet that is low in both carbohydrates and fats. The solution to “ammonia breath” for people on a low-carb diet is often to increase fats in the diet, and cut back some on protein foods. Above all, don’t let problems with your breath derail you from staying with a diet that is improving your health. Instead, try to figure out the cause of the bad-smelling breath and tackle it. Have you recently followed a low carb diet? After which you have become aware of a sudden change in your breath from always fresh to a smelly one? If your answer is yes, then there’s a probability that you are afflicted with the condition identified as ketosis bad breath. You may not be familiar with this although halitosis is the usual set back for a lot of people who are following a low carb diet plans like the South Beach Diet or Akins Diet. A standard part of low carb diets is that they have the tendency to hold back the quantity of carbohydrates that a person can consume. As an alternative, the person is suggested to dine with foods containing mostly proteins. Incidentally, carbohydrates are what invigorate our bodies and gives its energy. Once the body has a little supply of carbohydrates to burn, as a substitute, it turns to fat stockpile and utilizes them up for energy. This process is called ketosis. In the course of ketosis the body makes use of more water than it is normally necessary. Consequently, this can decrease the levels of the saliva in your mouth and can lead to dehydration. This is an important fact since dried out mouth is the number one aspect that can produce oral bacteria and make them grow excessively resulting to halitosis. To boot, for the period of ketosis, a particular chemicals called ketones are discharged. These ketones can disturb your body’s ph balance, and yet again resulting in a bout of foul smelling breath. How can Ketosis Bad Breath be remedied? When the bad breath has began to manifest during the commence of the low carb diet regimen, then at the end of the day, you have to think about bringing back carbohydrates into your daily diet and do this if you’re really determined on the subject of liberating yourself from discomforting bad breath. However, if you are taking in a normal quantity of carbohydrates but still haven’t perceive any significant development in the condition of your breath, then you may have to be concerned about it because that bad breath may have been sparked off by a different precise cause. In an instance, ketosis bad breath can also be prompted by some critical medical conditions like a certain troubles with the intestines or stomach; however, it should be taken into consideration that this explanation is merely responsible with just a little percentage of this case. Meanwhile, if one is diabetic, ketosis can lead up to a circumstance called ketoacidosis, which is the outcome of the blood turning out to be extra acidic. In this situation, some symptoms could arise like vomiting, confusions and can even go as far as bringing about comas and death. In case, you may need to see if your body is running out a ketosis, the thing to do is to go to the nearest local chemist for exam and purchase a ketone testing strips. These strips works the same way as any other test strips, when the indicator turns purple at the drop of your urine in the strip, then you are positive with ketones. Over-all, consult with professional medical doctor for treatment if ketosis bad breath persisted for a longer period of time.